Athena was below the C-Record and Chorus groups in the late 80's and into the 90's. 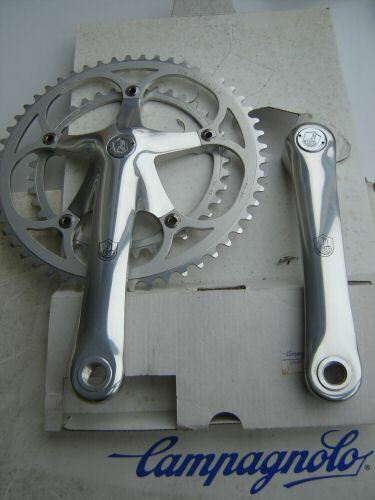 The cranks are very similar to the Chorus and Croce d' Aune groups and are often confused for one another. The Campagnolo Athena crankset is manufactured from forged Avional aluminium, stress relieved, polished and anodised to a jewellike finish give the Athena crankset a look that is distinctly Campagnolo. The crank arms are availabe in your choice of either 170mm or 172.5mm lengths. Complementing the crankset are chainrings in a full range of sizes, they are available from 39 to 44 teeth for the inner and from 48 to 53 for the outer. Like all Campagnolo chainrings the teeth are precision machined, one by one, not stamped like most other chainrings.